Two packages were waiting for me when I got home this evening, delivering these goodies! From Greenwood Fiberworks, there was a skein of cotton/lycra sock yarn in a color called Shocking Lipstick. I love this color - it's somewhere between bright coral and red. It reminds me of a 1950s lipstick color. And with the sock yarn -- for free! -- was a sock pattern! How cool is that? 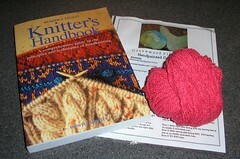 The other package was from Amazon, and included a copy of Montse Stanley's Knitter's Handbook. I've read lots about how comprehensive this book is, and a quick glance through certainly verifies that. Along with Montse was a copy of Kris Kristofferson's All-time Greatest Hits (which somehow didn't make it into the picture), just because I read about how Kris was turning 70 (!!!!) this month. That made me check my iPod, then my CD collection, only to discover I own nothing by him. I know a lot of people don't like greatest hits compilations, but this included every song I wanted: Me and Bobby McGee, Sunday Morning Coming Down, Loving Her was Easier, Help Me Make It through the Night, and more. Yes, he wrote all of those songs, and was a Rhodes Scholar to boot. Not to mention, he's still not bad looking! About 12 or 13 years ago, I saw him perform at Willie Nelson's 4th of July celebration in Luckenbach. It was hotter than hell (literally) but he and Willie were amazing to watch!